Home Blind Bag 70372: The increasingly complicated mathematical relationships of the NEXO Knights. Blind Bag 70372: The increasingly complicated mathematical relationships of the NEXO Knights. 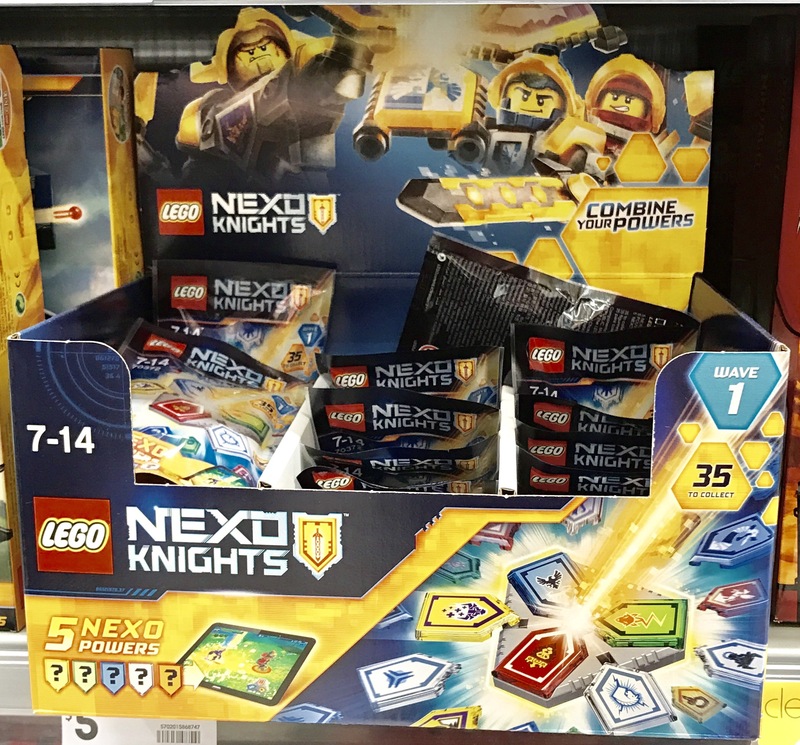 January 2017 sees the release of the next wave of NEXO Knight sets. Entering the second year, we see new colors entering the overall design aesthetic, particularly dark grey and purple, as we now have silicon based allies for Jestro and his cronies. The Rambling Brick made its debut almost 12 months ago with a review of Ultimate Macy – boasting new pieces, new colors and a new go get’em heroine, it was an interesting starting point for me in the theme. This year sees the launch of the Battle Suit NEXO Knights. After last year’s Ultimate series, these shake things up a little, putting each of the knights into small mech-suits. This is set/pack 70372. Five shields in a blind bag: We have spoken previously of the use of the NEXO Knights’ shields to provide power ups in battle in the Merlock 2.0 App. You can now get five shields and some other pieces in a blind bag. If you have friends or relatives who are prone to pick up random collectable minifigs for you, make sure they do not expect to find a mini figure in these packs – otherwise they will be bitterly disappointed. I will however find five of the pentagonal NEXO Knight shields, each with a unique power. These shields are one of 5 different colors: each representing one of the primary NEXO Knight heroes: Clay, Aaron, Lance, Macy and Axl. Different heroes can use any power. As far as other pieces are concerned, there is a 2 x 2 tile in dark blue, two light bluish grey 1 x 2 plates with clips on the side, one 2×2 round plate with a rounded bottom to go underneath this. Then there is in the absence of a better name, the Nexogon. This is a six sided piece, with 3 sets of 2×2 studs. It allows connections by clips to a 3.18mm bar, as well as via plates or using a technic bar down the middle. Some of the ways in which this new piece can be used have been explored by Tim Johnson, over at New Elementary. You also get a checklist, showing all 35 shields in this wave – the red oval shows powers available in 2016 videos, and yellow shows powers available from sets in 2016. The green oval shows powers that are new in the 2017 Nexo knight sets (including the Battle Suit Sets). The Mauve marks shows powers making their debut in this series. The unmarked powers are likely to be difficult to otherwise find ‘in the wild.’ Some may have appeared in comics, LEGOLand parks, toys such as the NEXO foam weapons , or during trade shows, but I have been unable to establish their providence. If you know where they are from, please let me know. I bought three packs, and got 14 different shields. Of these I had 2 which I had previously scanned from video clips on LEGO.com. I also purchased Battle Suit Lance – who comes with 5 shields. The Winged Pegasus power is one of those – so I suspect there will be rapid doubling up of shields if you collect the figures as well as these shields. There is no information readily available at this stage as to the contents of the box, as far as a shield distribution is concerned. One of the things the new NEXOgon shields allow is to combine three NEXO powers into one scan of powers into the Merlock 2.0 App, which in turn allows for new powerups. Given that at present (mid january 2017), 226 different shields have been identified, this combination allows for 11,390,400 different combinations of three different shields [or merely 39,270 combinations using those present in this series alone…]. I love the new NEXOgon, and look forward to experimenting with them a little more. Each battle suit figure also comes with one of these combination plates. The game has lost a bit of its appeal for me over the last few months, and I am wondering if these packs are an attempt to breathe new life into the game; inspire collectors, distribute the new piece or a bit of everything? I did however appreciate the fresh 12 powers to scan when I opened the packets. It is nice to be able to have a physical shield for the powers you have otherwise scanned off the computer screen or other sources. I look at these packs for the pieces, as such I give it three out of five Arbitrary Praise Units, but would increase that if I was given eight packs. Like wise, if I was a NEXO Power completionist, I would be likely to score it higher. I paid $AUD5 per bag at a local retailer. The box suggests that this is wave one…I wonder how many we will have into the future? Are you a fan of the NEXO Shield powers? How about the NEXOgons? Leave a comment below. PS if you think you can do something awesome with the NEXOgon, New Elementary are looking for people to experiment with some. Follow this link to find out more.